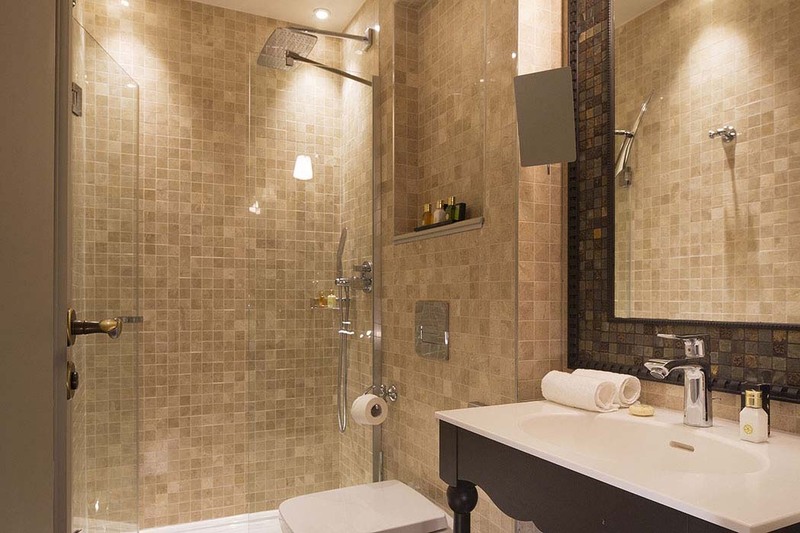 I am a great believer that boutique chic will give you a much more memorable stay than a big faceless hotel chain, even though going down this route can be a little more hit and miss in terms of what you get. I am reminded of a trip I took to Avignon many years ago where my hubby and myself stayed in a historic B&B in the centre of this dear town. The teeny, tiny house came complete with beamed ceilings, archaic tiny windows, thick exposed brick walls and all sorts of objets d’art from antique side tables to a wooden lady shaped coat stand that was frighteningly life like when we arrived back to our candle lit room late at night. The place was small and quirky but reaked authenticity. Everything was just right, from the simple but beautifully fresh breakfast, the millions of night lights and lanterns in the courtyard and up the stone staircase, to the owners couldn’t have been more perfectly French – I swear I saw the husband popping on a berret and cycling off with a bunch of onions and a baguette in sticking out of his bicycle basket! 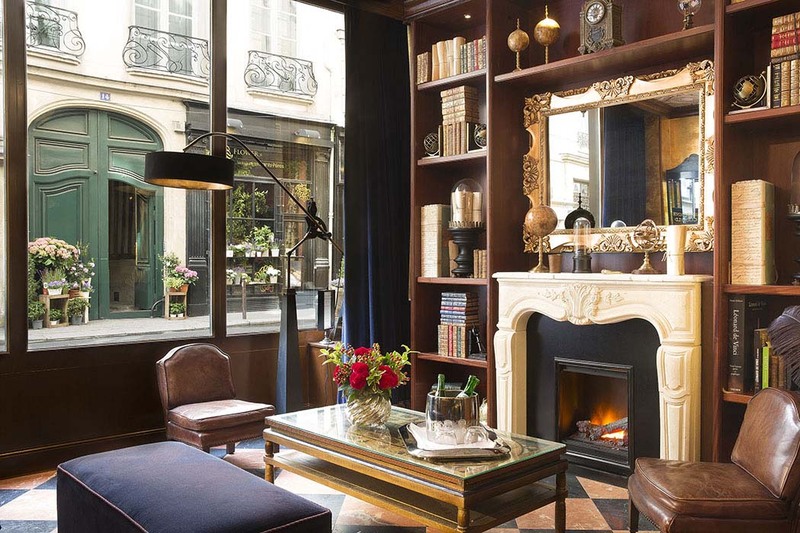 To this end I have been trying to find an authentic luxury hotel with character in Paris and I believe this little gem is as good as it gets. 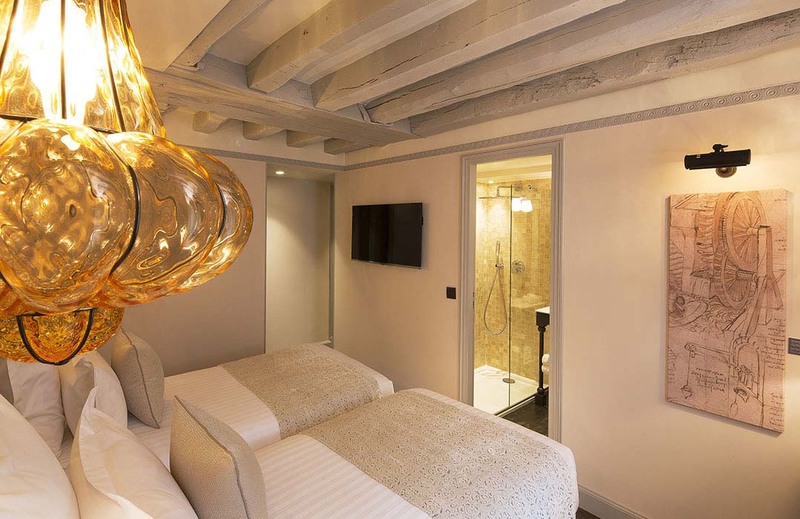 The five-star Hôtel Da Vinci with just 24 rooms opened in June 2014. 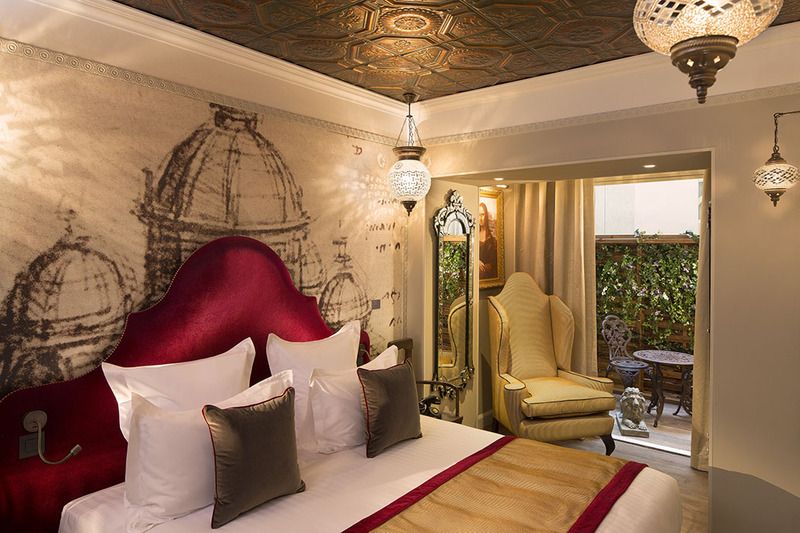 The highly original decoration is a huge attraction here and takes guests on a journey to the heart of the Renaissance, with the period’s most iconic figure, Leonardo da Vinci as its theme throughout. The entire hotel pays tribute to the man who, under the protection of the French King, Francis I, made a major contribution to the advancement of the cultural and intellectual influence of Europe in general, and France in particular. For a few days in August 1911, one of the rooms housed the most famous painting in the world: the Gioconda! The “Mona Lisa Room” celebrates the legendary work. The journey back to the Renaissance starts in the lift where there is a glass panel is a window through which you can admire a series of drawings taken from the various studies executed by Leonardo da Vinci. 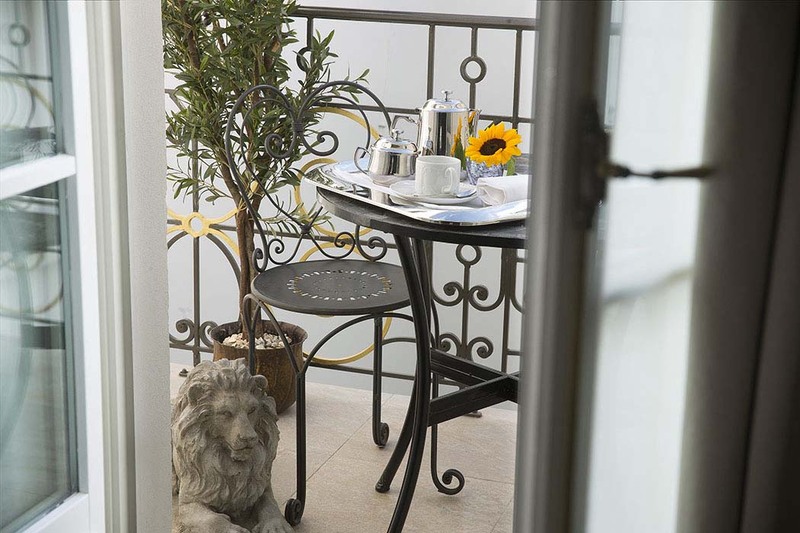 The hotel’s 24 rooms are named after the leading figures of the Quattrocento. These include Botticelli, Raffaello, Michelangelo and Catherine de’ Medici. The invitingly comfortable rooms are decorated in a style that takes in a great many references, such as a highly typical caqueteuse chair, or a dressing room with curved features, reminiscent of the wardrobes of the period. Almost half the rooms have balconies. 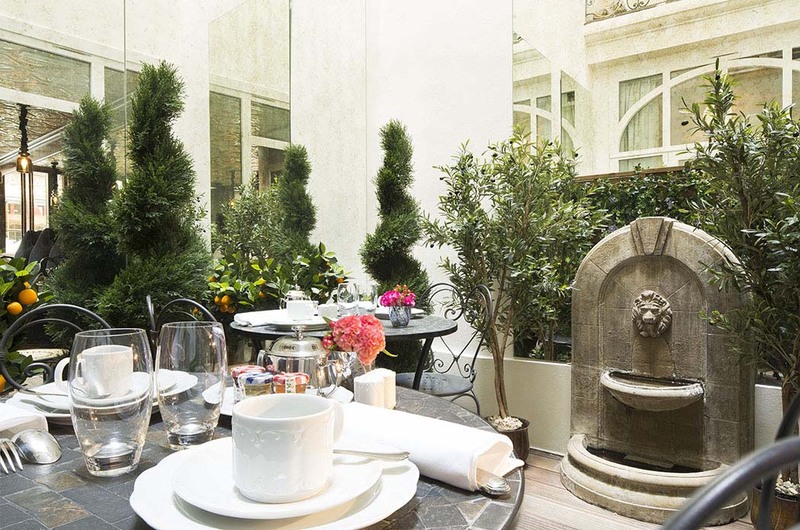 Some look out over the hotel patio, a haven of peace and quiet, while others, overlooking the Rue des Saints-Pères, afford a glimpse of the Louvre nearby! The Mona Lisa room is the one to book if available. Situated on the ground floor, Leonardo da Vinci is never very far, as the room contains an unfinished work! Could it be the famous Gioconda, which he took three years to paint? This is one of the hotel’s most charming rooms, with its pleasant terrace overlooking the hotel’s patio, a haven of peace and quiet. The Médicis rooms is steeped in the history of Leonardo’s genius and the fascinating world of his patrons, the Médicis family, thanks to whom he became one of the most famous creators of his time. 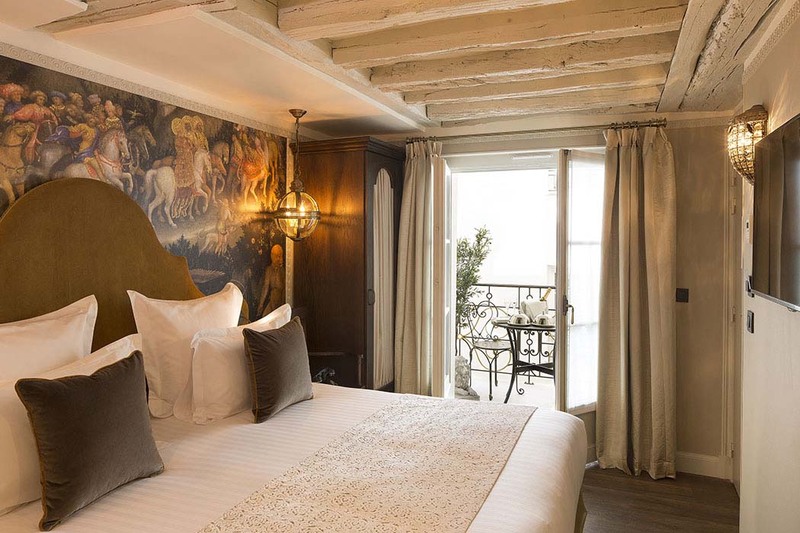 At the head of the bed, there are frescoes inspired taken from one of his earliest works, “Madonna of the Carnation”. 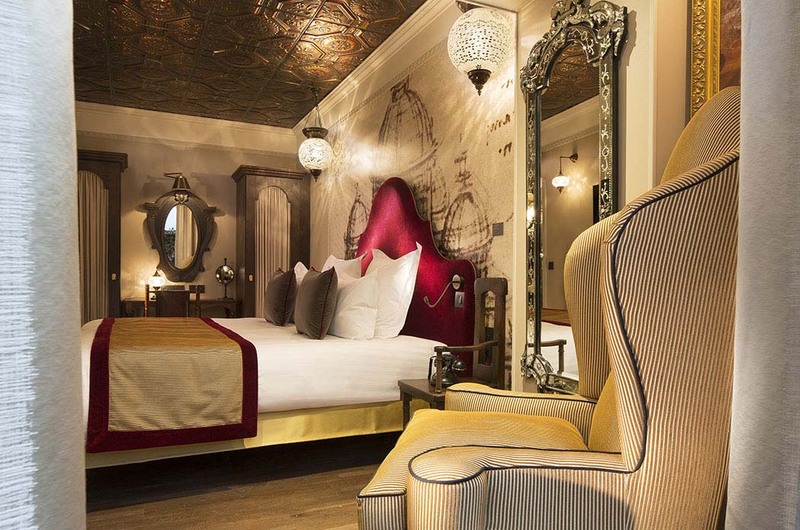 The rooms’ colour scheme blends in harmoniously with colour palette of the famous canvas, while magnificent Venetian mirrors add to the charm of their unique feel. The Inventions rooms pay tribute to Leonardo da Vinci’s innovative genius. At the head of the bed, there are frescoes taken from some of his best-known technical drawings. The colours recall those used in his studies, while — in keeping with his Italian origins – the blown-glass ochre lighting was produced in Venice. The Inspirations rooms celebrate the enormous talent of Leonardo da Vinci as a painter. At the head of the bead, there are frescoes from some of his major works, including: “The Battle of Anghiari”. The warm colours are reminiscent of those used in his best-known paintings, while — in keeping with his Italian origins – the blown-glass ochre lighting was produced in Venice. The Renaissance rooms are largely inspired by the period. 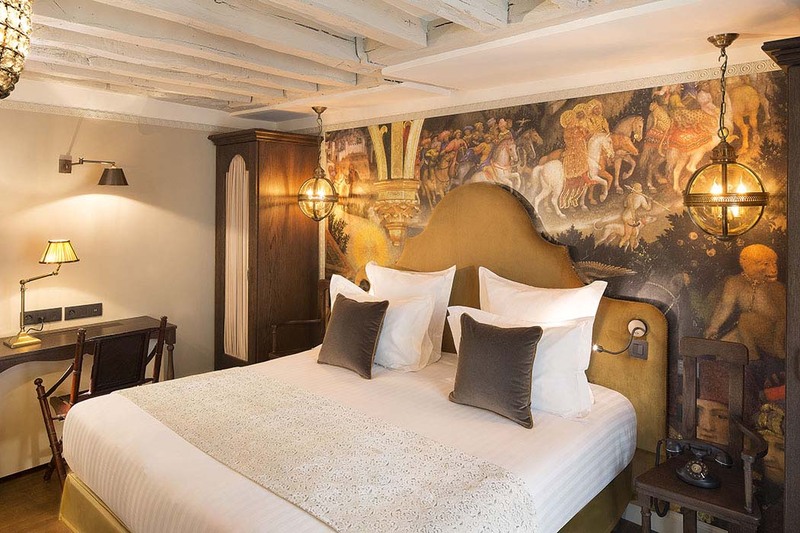 At the head of the bed, there are frescoes representing some of Leonardo da Vinci’s major works in a pastel palette that recalls the colours in use at the time. 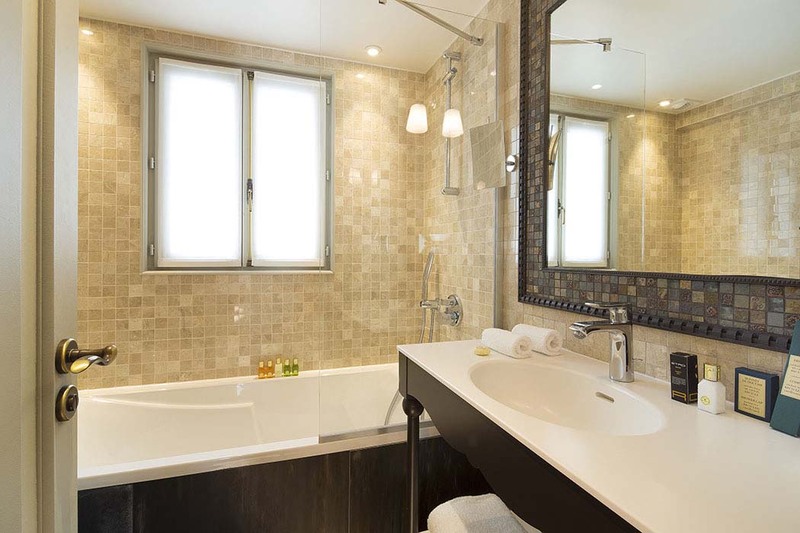 Magnificent Venetian mirrors add to the charm of their unique feel. On 21st August 1911, one Vincenzo Peruggia pulled off the theft of the century. He managed to steal the Louvre’s best-known painting: the Gioconda. 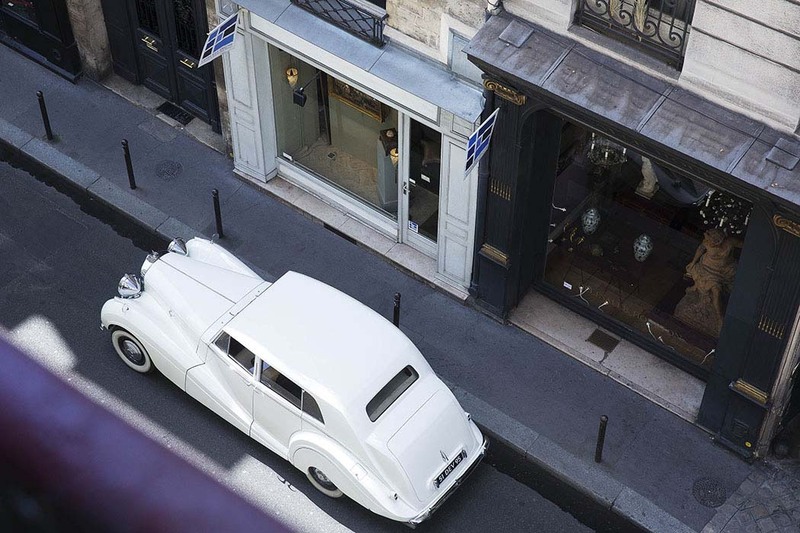 With the police on his trail, he found refuge in this hotel room for a few days, until the pressure subsided and he was able to return to his home in the Rue de l’Hôpital Saint-Louis with his precious loot. Public opinion and the press soon took a keen interest in this mysterious disappearance. The room is decorated in a style that recreates how it probably looked at the time. 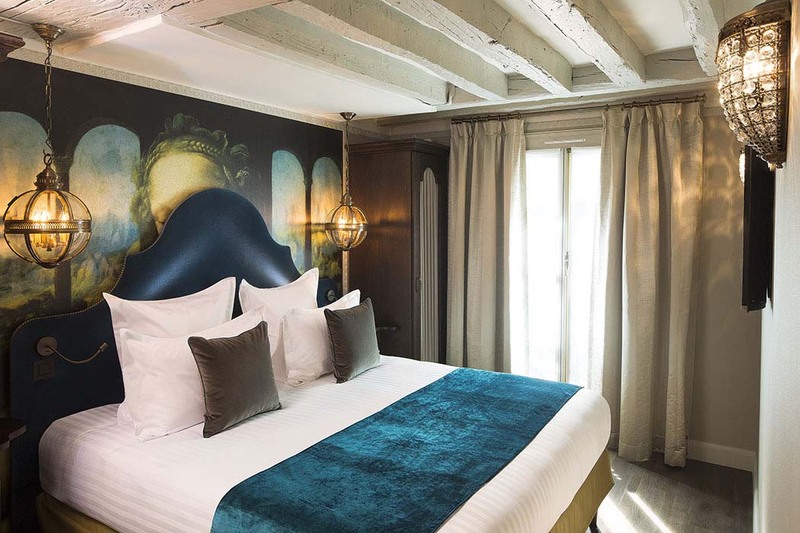 Period photos and frame without the famous canvas: the Thief’s Room beckons its guests to immerse themselves in the thick of its incredible history! 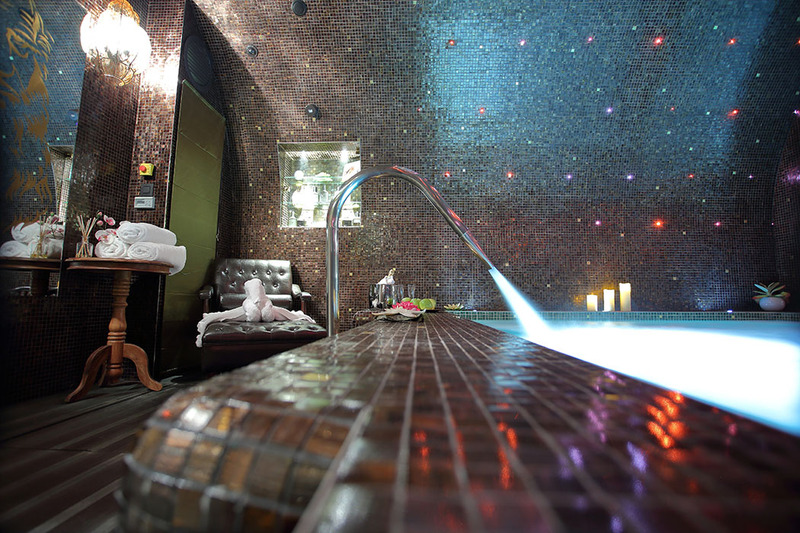 The relaxation area, situated on the lower ground floor, is arranged around a mosaic-lined pool that reproduces the colours used by Leonardo da Vinci to paint the Gioconda. 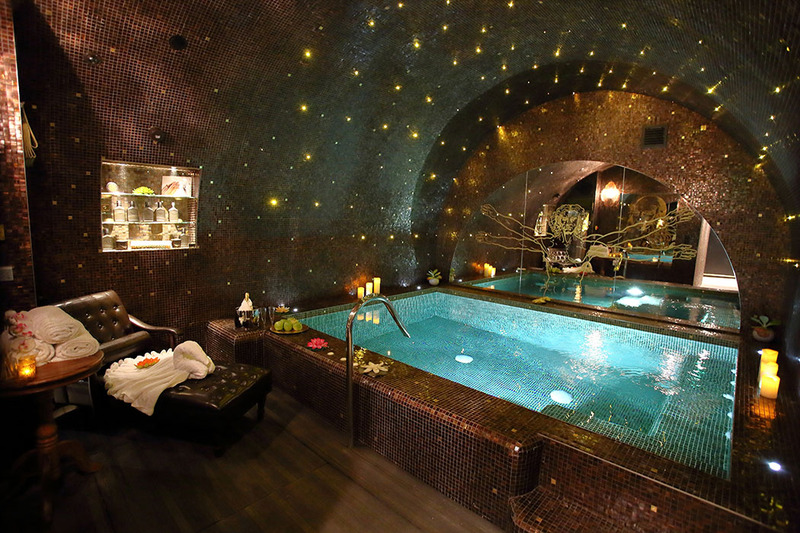 The star-studded arch creates a perfect cocoon for ultimate relaxation. Book at reception to enjoy your own private pool session, that relaxes and tones thanks to its built-in counter-current system. Café Da Vinci looks out onto the Rue des Saints Pères, on one side, and the hotel patio on the other. It is open all day, for breakfast, coffee or to have a drink. 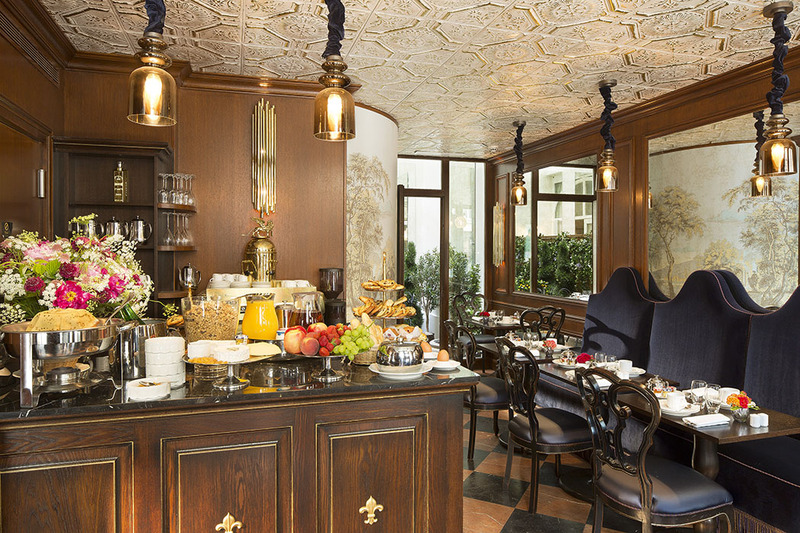 Although the café is a truly Parisian tradition, Café Da Vinci adds a further touch of refinement with its decoration, which is inspired by the oldest and most famous café in Venice, Caffè Florian. The ceiling and floor motifs are identical, and the wood panelling on the walls helps to recreate the same peaceful, elegant atmosphere. 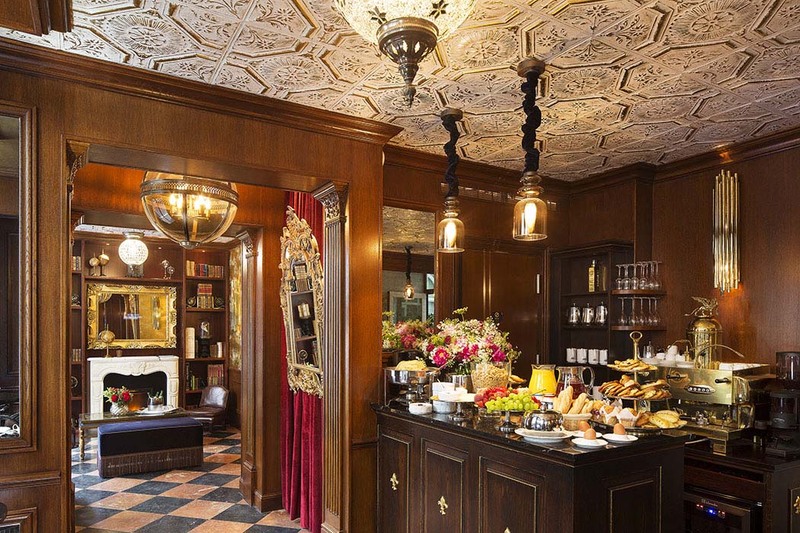 But the resemblance doesn’t end there: Café Da Vinci serves one of the best espressos in Paris, thanks to its very special percolator, which is an exact replica of the one still in use at Caffè Florian. 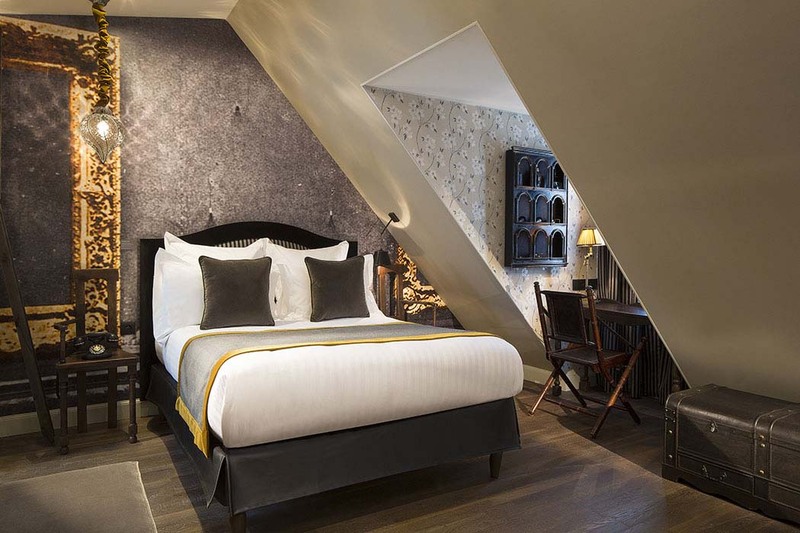 Set in the heart of Paris, Hôtel Da Vinci is the ideal pied-à-terre for discovering the city’s main monuments and sights, as well as for going on a shopping spree. 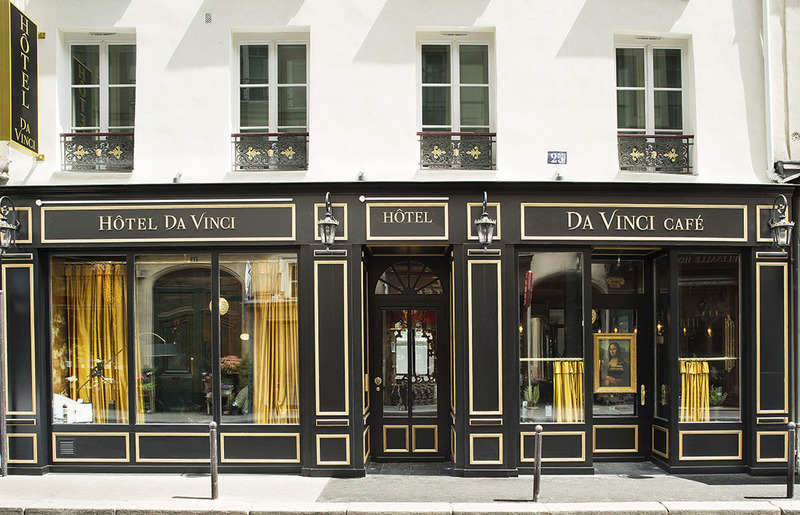 Hôtel Da Vinci features in our 10 Best Luxury Boutique Hotels in Paris and our best small luxury hotels in Paris for valentines.